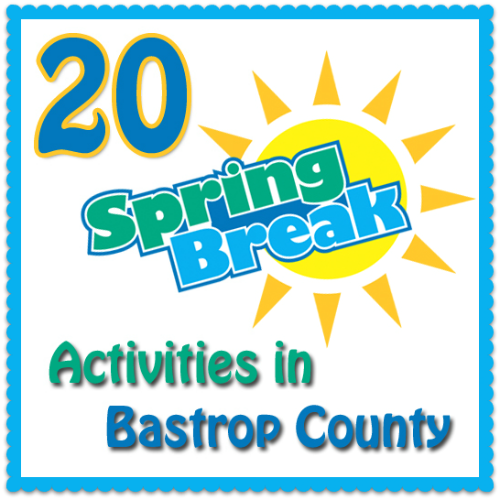 Spring Break is upon us, so if you're one of the parents who are scrambling to figure out what to with your kids, here are 20 Spring Break activities in Bastrop County. Go roller skating at Bastrop Skating Palace. Jump in the bouncy castles at Giggle N Jump. See a movie at Schulman Theatres Lost Pines 8. Get your workout on at the Smithville Recreation Center. Go canoeing, kayaking, or tubing, or try out SUP (stand-up paddle boarding). Visit the animals at Capital of Texas Zoo. Go on a scavenger hunt at the Dinosaur Park. Go bowling at Schulman Theatres Lost Pines 8. Go skateboarding or roller blading at Power Plaza Skate Park. Go mountain biking at Rocky Hill Ranch. Experience the Renaissance at Sherwood Forest Faire. Play black light mini golf at Schulman Theatres Lost Pines 8. Take a class through the Bastrop YMCA. Go hiking, fishing, and/or camping.